In Ontario, common law spouses are not always treated the same as married spouses under the law. The definition of “spouse” is different in the Succession Reforms Law Reform Act (Ontario) compared to the Family Law Act (Ontario). The net result of this is inconsistency is that common law spouses do not have the same automatic property rights as married spouses. If you die intestate (without a will), your common law partner will not receive or inherit your assets. Assets include any thing you own that has value, such as //www.hummingbirdlaw.com/real-estate-lawyer-toronto/real estate, bank accounts, pensions and personal items. Instead, your entire estate will go to your closest blood relative in accordance with the Succession Reforms Law Reform Act (Ontario). This could be your child, parent, or sibling and completely omits your common law spouse. It is an unfortunate and inadvertent outcome that can be both financially and emotionally devastating. There are three easy ways to avoid this undesirable outcome. Have a Will: A will is a simple and economical way to avoid this inadvertent and sometimes catastrophic result. A will is a legal document that appoints an Executor or Trustee to carry out your wishes after you die. In this document you can direct your Executor to legally transfer your property and assets, whole or in part, to your common law spouse. Thus ensuring that your assets go directly to the person you intend to continue to provide support. It is important to have a lawyer prepare your will so you know that it reflects current law, includes all the powers your Executor may need, as well as meets the requirements of a valid will. This small investment will save time, money and emotional distress for your common law spouse. Hold Property by Joint Tenancy: Another way to provide for your common law spouse is to hold title to property by joint tenancy. By operation of law, the survivor of a joint tenancy inherits the entire interest or ownership of the property. 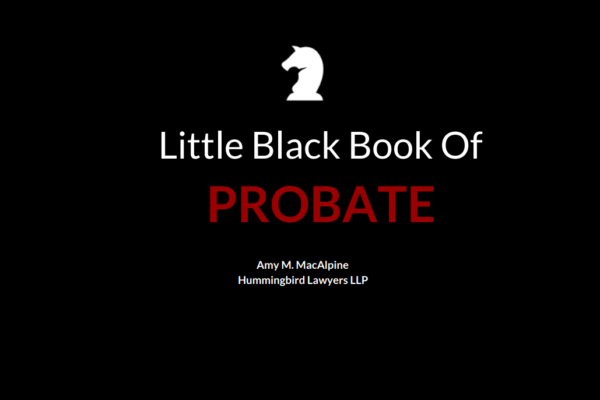 This happens automatically and will not require a will or probate. Also, by passing outside of the will, this asset will avoid probate fees and put more money into the pocket of your common law spouse. Bank accounts and real estate are easy assets to transfer into joint tenancy. Prior to transferring any property you should consult your lawyer and accountant to discuss all the possible tax and legal consequences. Complete Beneficiary Designation Forms: A third way to prevent your common law spouse from being left out by your estate, is to complete beneficiary designation forms provided by life insurance policies, RRSPs, RRIFs, TFSAs, and pensions. By doing this, the funds will automatically go to the beneficiary listed, outside of the will, and without probate fees. Before completing your beneficiary designation forms, you should confirm with the administrator as to whether or not your decision is revocable. Keeping track of your beneficiary designation forms and making sure they reflect your current wishes is crucial. A common misconception is that making a will or getting married, will trump an old designated beneficiary listed. Amy MacAlpine is an associate with Hummingbird Lawyers. She supports clients in the areas of Wills and Estates, Litigation, and Family Law.